First let me congratulate you on taking the first step in protecting yourself and your family! 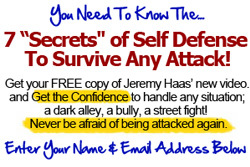 ARCS SELF DEFENSE video training is formatted so you can quickly take all the information in that will save your life in any hostile situation. You’ll find my training shows you the science and principles behind the ARCS system. Auto Reflex Combat Systems (ARCS) does something few other do, we teach you to use your instinctual startle/flinch reflex as a bridge into your self defense combatives techniques. Why train your body to work against its natural reactions, when you can use those same reflexes to save your life? Immediate access to video training materials! Full Screen Capabilities – Every lesson has full screen HD capabilities! Make sure you fill out the info to left for immediate access and take advantage today! It’s free and your information will remain confidential! User assumes all responsibility and ARCS Self Defense will be held harmless in any legal or civil action taken against the user as a result of implementing or engaging in the methods that appear on any ARCS Self Defense program. ARCS Self Defense provides this information for EDUCATIONAL PURPOSES ONLY and the user accepts all responsibility.